They say the states are supposed to be the laboratories for legislative creativity. We can watch what works and what doesn’t, emulate the best and avoid worst, and improve the lot of everyone. But what happens when the mad scientist is the federal government, cramming an experiment down the throat of a particular state and county? What if their process is textbook “arbitrary and capricious“, and yet they clearly aspire to go national with the results, regardless of efficacy? States and localities around the country reacted with horror to the now famous2005 Kelo vs. City of New London Connecticut “takings” case. How should they react to the virtual taking of an entire county’s property, knowing that theirs may very well be next? People sometimes say that by electing a super-rich person to public office, that office-holder is less likely to be beholden to equally rich special interest groups. In the case of New York City’s Michael Bloomberg, we may just be seeing how a super-rich, non-reelection seeking mayor might not need to care what any of his constituents think. Bloomberg certainly deserves kudos for determination and sticking to principle. Too bad for all of us that they are the principles of a statist. I’m of course referring to Bloomberg’s latest governmental crusade: “educating” our increasingly obese society on proper portion sizes, via a proposed (and likely to be implemented) ban on “sugary drinks” of more than 16 ounces. Thankfully, numerous commentaries are noting that determined consumers can just buy a second drink, or more importantly, that government has no role in intervening in people’s eating habits. Fully one-third of America’s population is considered obese, with 6 percent being considered “morbidly” so. Nearly 21% of America’s annual health care expenditures, or about $190 billion a year, are related to obesity. “The built environment generally is changing to accommodate larger Americans. New York’s commuter trains are considering new cars with seats able to hold 400 pounds. Blue Bird is widening the front doors on its school buses so wider kids can fit. And at both the new Yankee Stadium and Citi Field, home of the New York Mets, seats are wider than their predecessors by 1 to 2 inches. Worth talking about, indeed. But from what I’ve seen so far, I think we’re asking the wrong questions. 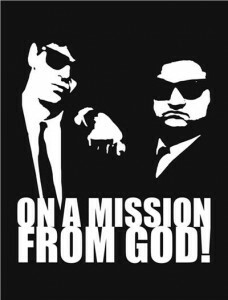 At least Jake and Elwood had a fallback, something they could lean on when in need of a little moral support. When it comes to “climate change”, what and where exactly is President Obama’s support? Addressing climate change just doesn’t rank very high with voters. Amongst the top ten “most important issues” listed in a recent Rasmussen poll, climate change was not to be found. And the trend on what people believe is the root cause of global warming has the planets beating the people pretty handily. Dealing with the oil spill is one thing. Making the leap from there to push a a costly “cap-and-trade” energy policy faintly associated with climate change is quite another. It seems that rather than confronting a supposed “inconvenient truth”, Obama is attempting an inconvenient non sequitur. Anyone needing proof that at least one U.S. Senator exists who truly “gets it” with regard to the government’s role in creating our recent financial debacle should devote 10 minutes to watching this video. This was South Carolina Senator Jim DeMint’s allocated time in questioning Federal Reserve chairman Ben Bernanke during the latter’s December 3rd renomination hearings in the Senate Finance Committee. It’s great theater, Bernanke’s I’d-rather-be-having-a-root-canal demeanor notwithstanding. “When Congress created the Federal Reserve, they created arguably the most powerful institution in the whole world. Our whole economy, all our prosperity, wealth, rests on the soundness of the dollar, as does much of the economic systems all around the world. So as we consider your renomination it’s important that we ask some difficult questions, not just of you, but to ourselves, because no one can say that there haven’t been major failures and I think a lot of us have to admit that the Federal Government, the Federal Reserve let down the American people and a lot, a lot of people have been hurt. “For me perhaps the biggest failure, in the Federal Reserve, in the political side here in Washington, is that, amid all these failures, the politicians, the folks in the Administration and Federal Reserve, have claimed credit for saving the system, while blaming capitalism and unrestrained free markets for our problems. That has justified the positions that are now being taken here in the Congress in many ways, to come back and even extend the control, the intrusion of the Federal Government further into the private sector. I think you’ve been a big part of orchestrating that, and shifting the blame onto the private sector. Although I’ve written about this before, it warrants repeating that the attempts by many to move our economy away from free markets, to any extent, truly risk killing the golden goose. And with the government’s nearly perfect track record of never repealing any major program or initiative, the stakes for preventing such major legislative endeavors that might permanently weaken our preeminently free-market orientation have never been higher. “To a large degree the oversight that we’re responsible for here in this Congress we did not accomplish because of assurances that we’ve gotten over the years, from your predecessor and from yourself and by doing that I think we have egregiously failed the American system. DeMint here is referring to S604, the Senate counterpart the Ron Paul/Alan Grayson Amendment (HR 1207), which recently passed 43-26 in the House Financial Services Committee, much to the fear of Federal Reserve itself. DeMint’s intentions here call the bluff of many who would call upon even more regulation and oversight of all aspects of our economy: Evidently there are still plenty of elected officials who are not comfortable with this oversight extending to certain government agencies. Lastly, it is well worth noting that voters who agree with DeMint’s worldview can thank The Club For Growth for helping him and other liked-minded individuals get to Washington. The Club’s legal ability to advertise itself is outrageously limited (perhaps this is Washington’s notion of limiting government). Anyone wanting to see DeMint’s perspective advanced in Washington should encourage and support similar candidates, and the Club’s track record in getting that done is impressive. In the never-more-important war of ideas, having candidates who will reliably legislate from the limited-government side is correspondingly crucial. JP Morgan CEO Jamie Dimon’s recent commentary in the Washington Post proclaims that financial institutions need to be able to fail. He also describes the need for regulatory changes that would enable this to happen while minimizing the effects should a firm do so. What he does not describe is why firms need to be able to fail. Judging from the comments out there, it’s clear there’s a need to understand the why. It is central to understanding what regulatory changes, if any, are even required. Mr. Dimon is correct for one simple reason: When there is the perception of risk with a trading counterparty, risk management will arise to deal with that risk. Due diligence with regards to understanding the counterparty will increase in proportion to the perceived risk. In the extreme case, risk management may dictate that the trading (however simple or complex) may not take place at all. Note that “trading” in this case is not simply what everyone envisions on some Wall Street trading floor, but the very essence of any transaction between two individuals. The absence of “too big to fail”, and the extra due diligence that would have instead been present, would likely have prevented the entire housing-related financial debacle we’re all living through, including the current hand-wringing about what to do about it. When a firm is deemed “to big to fail”, anyone trading with that firm is afforded the luxury (or trap) of letting their risk management guard down. “Hey, my counterparty’s existence is a sure thing — why should I care what they’re doing behind my back? — It can’t affect me.” The story of the Norwegian town of Narvik illustrates this perfectly. With truly free trade, two potential trading partners, X and Y, will only trade if they make each other better off. To do that, they must know each other’s needs. Say X and Y are contemplating a transaction, but X is deemed “too big to fail” by some trusted third party — ie, 100% trustworthy in their ability to fulfill their obligation to Y, and/or of their ongoing existence. Trading partner Y now has far less need to understand trading partner X. In some ways, rather than Y needing to exhibit reciprocity in its care for its trading partner, it can act more selfishly, focusing more so on its own gains. Knowing that X’s continuation is a sure thing, Y might not even feel entirely obligated to honor their obligation to X — “If I don’t, what difference will it make to them?” This, combined with lax bankruptcy penalties, might have been all that was needed to prompt some people to stop paying their mortgages as their houses went “upside down”. Amongst the chain of players in the housing market, note the prominent role of Fannie Mae and Freddie Mac, two institutions that were generally thought of as “too big to fail”. Any mortgage originator who could raise product in a way that could conform to Fannie or Freddie’s securitization requirements could lay off whatever risk they initially had to these organizations. They were therefore incentivized to raise as much product as they could, earning commissions and short term compensation along the way, knowing that anything Fannie or Freddie did downstream was irrelevant. Loans to borrowers with sketchy credit profiles? No problem! Sell ’em off to Fannie or Freddie! This is exactly what occurred with firms such as Countrywide Financial. Suppose that Fannie and Freddie did not have their implicit government guarantee, or political pressure to assist in expanding home ownership. They would then have been far more concerned with the quality of the collateral they were purchasing. This would have rippled all the way back to the origination of the loans, because the resulting loans would have been less marketable, and in many cases, perhaps not marketable at all. However, there would have still been a role for risk-takers to provide a valuable service to the market, in the form of making higher interest loans (to compensate for the risk) to higher-risk borrowers, and NOT selling the loans to a third party. But there would have been an important difference. It would be the free market and private decision making, as opposed to a political process, determining where on the risk-reward curve the business activity would be. Mr. Dimon also does not mention the massive instructional benefit of failure. While failure in and of itself is generally not pleasant to watch (perhaps with this exception), it is invaluable as a teaching tool. It allows all non-participants to learn in a way that is every bit as valid as those who did participate: Watching someone burn himself on a hot stove doesn’t require me to touch the stove as well to learn not to touch it. Simply knowing that people can burn themselves on hot stoves is enough to make me cautious and treat the stove with respect. This country needed to witness failure of lending to unqualified people to ensure that such poor business practices did not expand in scope. Failure of unqualified borrowers to obtain credit is not evidence of a broken free-market. It’s direct evidence of the market working! If failure were permitted to happen in an unhampered fashion, private defense against possible failure of trading counterparties would necessarily increase. There would be no need for a regulatory agency to try to outthink the market as a whole (an impossibility, yet one that many people sadly think is possible), because out of their own self-interest in self-preservation, companies would do it themselves. Even still, there may be opportunities for private firms to arise that would add additional risk-management services in the form of wider information visibility and/or better analysis. There is simply no need to politicize the function. Claims that companies self-policing themselves have failed ring hollow because the necessary punishment of true corporate failure was not present. A politicized version of the crucial risk-management function produces things like forcing a bunch of firms to take TARP money, even those who don’t need it, to shelter the identity of those who do. Discovering these weakened firms faster and more unambiguously is exactly the kind of information that market participants (companies AND individuals) need to correctly perform their risk assessment. Simply the threat of being put on such a list would be enough to keep an honest company concerned with the best interests of its customers off the list. And this is exactly where we’d wind up. Financial stability, security and trustworthiness would rapidly become the aspects that financial service companies would compete over. Large financial institutions would have to prove to their customers that they are conducting themselves in ways that make their customers comfortable in trading with them, lest they watch these customers go elsewhere. Not with some phony “too big to fail” claim, backed up with a politicized redistribution of private wealth, but with honest and verifiable proof using their own resources. It’s already started, with small and regional banks running ad campaigns highlighting the fact that they didn’t take TARP money. It’s a trend we need to encourage.